This is in honor of my Dad. See today marks twenty wonderful years that he and I have spent together. Nope I didn't turn twenty today, (My birthday was last month, and I'm a few years older than our anniversary.) And no he didn't just enter my life twenty years ago, I've been blessed to have him by my side since birth. Those who know me, I mean really truly know me, know my whole life has been "a long story", one crazy chapter after another. Through all those crazy chapters Big Bad Dad is the one person who has always been there, living those crazy chapters right along with me. So in honor of our twenty year anniversary I whipped up a batch of one of his favorites...deviled eggs. Really, I should say one of our favorites. I credit my love of deviled eggs to the Big Bad Dad himself. I can make a dozen and between the two of us somehow they disappear within a few days. We have, what I find to be, an amusing and ongoing disagreement when it comes to deviled eggs though. I say sweet pickle cubes are a must in deviled eggs, but to quote his paraphrasing of Clint Eastwood in Dirty Harry: "Nobody, but nobody puts pickles in deviled eggs." So for you deviled egg eaters out there I ask you, sweet pickles or no? Lay the eggs in the pan and add enough cold water to cover eggs by 1 inch. Set over high heat and bring just to the boil; remove from heat, cover the pan,and let sit exactly 17 minutes. When the time is up, transfer the eggs to the bowl of ice cubes and water. Chill for 2 minutes. Peel eggs and cut in halve lengthwise. Remove yolks and set whites aside. Using a fork mash yolks into until there are no lumps. Add mayo and mustard. Blend with fork until well combined and smooth. Add a splash of vinegar and salt and pepper to taste, and pickle cubes if using. Put yolk mixture into a re-sealable plastic bag, using scissors, snip a small corner off and pipe even amounts of yolk mixture into egg whites. 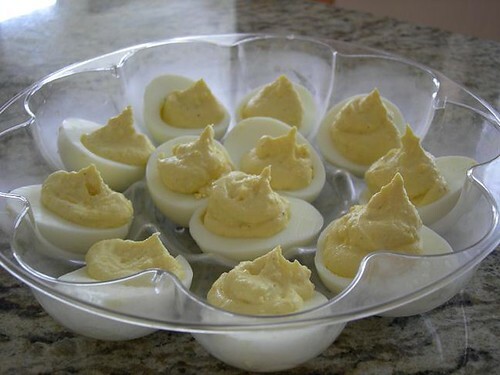 Store deviled egg in refrigerator. Comments on "Devilishly Good Eggs"
Deviled eggs, yes. Sweet pickles in deviled eggs, no. No to sweet pickles but yes to paprika on top! My daughter is on a big deviled egg kick right now. In fact, yesterday out of nowhere, she requested that I make her some deviled eggs. The sweet pickle relish is a "Southern" thing, I think. We love a little of it in our deviled eggs. I say yes to the sweet pickles, but try to substitute jalapeños diced up. The sweet pickle does sound good but i have guests that I'm making them for. When it comes to that i do not know what everyone likes to that extent. So, I'm just going to do the basic but with bacon bits on a few. That's our way of doing the eggs. Some one try and let me know what you think the bacon bits on top..fried or in a container work awesome.